Several months after departing from the moon, a Chinese spacecraft has arrived at a new destination about 930,000 miles (1.5 million kilometers) from Earth, according to news reports in China. The Chang'e 2 moon probe arrived at Lagrange Point 2 (L2) — a place where the gravity of Earth and the sun roughly balance out — on Aug. 25, the Xinhua news service reported Tuesday (Aug. 30). Chang'e 2 had left lunar orbit in early June to head for deeper space. China is now the world's third nation or agency to put a probe in L2, one of five spots in near-Earth space that serve as a sort of parking lot for spacecraft to hover without being pulled toward any planetary body. NASA and the European Space Agency have also accomplished the feat. Officials from China's State Administration of Science, Technology and Industry for National Defence (SASTIND) said that Chang'e 2 will carry out exploration activities around L2 over the coming year, Xinhua reported. 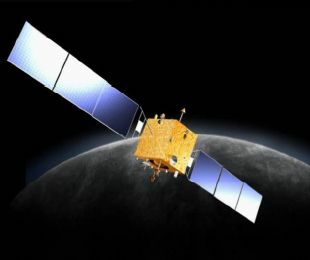 SASTIND also plans to launch two "measure and control stations" into outer space by the end of 2012, and Chang'e 2 will be used to test the stations' functionality at that time. During its time orbiting the moon, Chang'e 2 took a lot of high-resolution photos to help plan out future missions, which will actually drop hardware onto Earth's nearest neighbor. China is aiming to launch a moon rover around 2012, and another rover will land on the moon and return to Earth with lunar samples around 2017, according to Xinhua. Chang'e 2 finished up its duties around the moon in April but had enough fuel left over that officials decided to send the probe off into deeper space. The spacecraft's predecessor, Chang'e 1, launched in October 2007 and conducted a 16-month moon observation mission, after which it crash-landed on the lunar surface by design in March 2009.The Chang'e probes are named after the nation's mythical moon goddess.